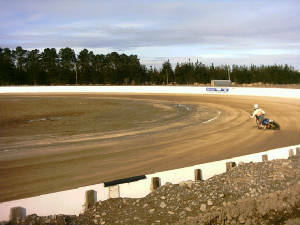 But initially a place's where girl's and boy's of all age's can come and learn the fine art of speedway riding. By then you should be able to handle a 500 compentently. Then we encourage you to go as fast as you can without touching the pole line or the fence or any body or other bike on the track at the same time as you. Trying to build respect for the other riders while going as hard as you can. dedicating time for their sport. 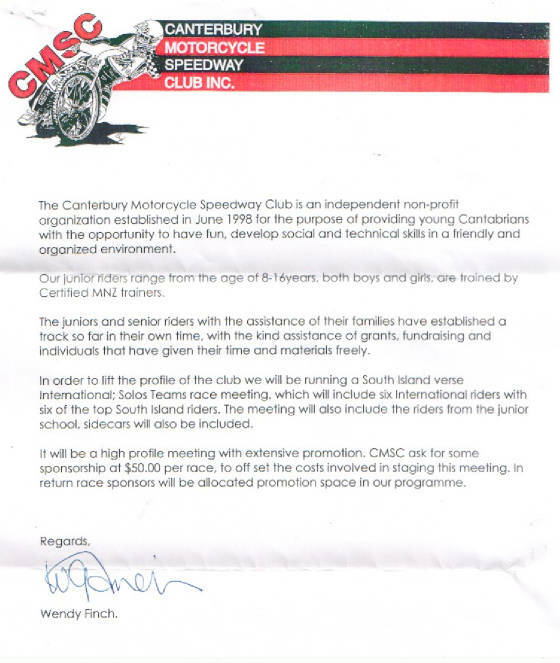 "Canterbury Motorcycle Speedway Club Incorporated"
2.Organise Speedway Motorcycle Racing in the South Island. of the CMSC on a National level. Please feel free to contact us anytime you have any concerns or suggestions. $15:00 per rider per day - payment goes to Charlie. If you can dedicate sometime once a fortnight then it will be welcomed. What a great day we had for Ronnie's anniversary Meeting the weather was loverly the riding was great good to see a lot of old faces around.Its a shame that a lot of people had to be some where else before the finals as with the rest of the day the racing was awsome.If this is an indication of things to come speedway rocks. MIRAC ON KEITH BOYCE'S MINT J.A.P. What a great day,congratulations to Daniel Mckinlay for taking out the main,the competition was very strong all day well done John Tuffley 63 looked like the quickest 4 laps for the day on a tricky track.The side cars all action as all ways,good too see the guys down from the north Island. 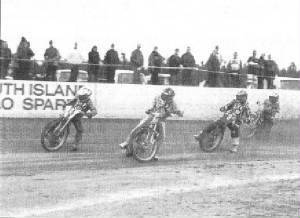 The tapes fly up and Ivan Mauger hit’s the turn first. 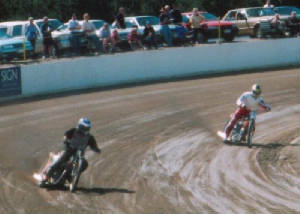 Ronnie Moore followed with current World Champion Anders Michanek of Sweden and England’s John Louis hot on his heels. 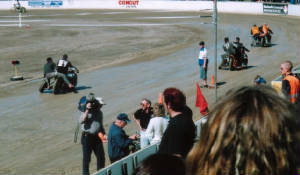 Moore clings on the back of Mauger’s wheel for two breath taking laps urged on by the fourteen thousand Templeton crowd. Mauger gradually pulls away , Moore takes second with Michanek third. The reception Moore received was that of a winner. Why? The year is 1975. 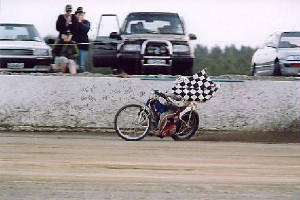 Moore at 41 years of age had just finished second to Mauger, ahead of the current World Champion, and had surpassed the World Long Track Champion Egon Muller from Germany, Scott Autrey from the United States, fellow kiwi hero Barry Briggs and Ole Olsen from Denmark in making the final. This was to be Moore’s last race in front of his home crowd as an accident in the same World Champion’s Troup in Australia nearly cost Moore his life and finished his racing career. 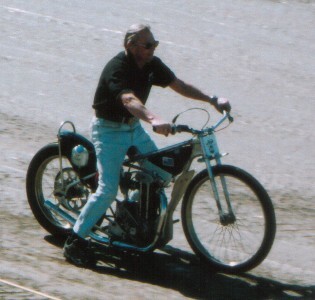 29 years later and 50 years after Ronnie Moore became the youngest rider at 21and first New Zealander to be crowned World Speedway Champion, Moore Park in West Melton, Christchurch, held the biggest Speedway bike meeting seen for some time. With over fifty races scheduled, it was a fitting end to weekend of celebrations honouring the twice World Champion and winner of many other prestigious titles. Ronnie Moore is still a household name amongst the speedway fraternity all around the world, and his loyalty to New Zealand, Christchurch and Speedway is second to none. A Mayoral reception followed by a function at Woolston, Vintage Speedway Display and the Christchurch Motorcycle Speedway Club meeting all honouring the man "Mirac". Over 70 racing combinations fronted for this meeting from all over New Zealand with some very spirited racing to mark the occasion. Nine Auckland riders came down along with four side chair units. Eighteen machines including four chairs from Oreti, Invercargil and eight riders from Westport joined the thirty odd Christchurch riders. The respect that many hold for Ronnie Moore was evident in the effort that all the participants, organising personnel and sponsors put in for this meeting. Many turned up and said "they were there for Ronnie". The man himself led the grand parade, stopped and picked up Sue who had come over from Tenerife in the Canary islands for the weekend, and continued around the track for another lap. 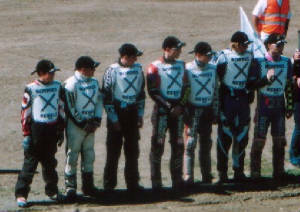 He then stopped in front of the line up of three teams of South Island solo riders in team uniforms as Alan Crosby announced his intention to re introduce Kiwi League racing between the "Oreti-Stormers", Invercargil, "Tasman Tigers", Westport and of course "Ronnies Rebels", Christchurch. More words of inspiration from Ronnie to the teams and then we stepped aside for a days racing. Ronnie stood back as youngsters took to the track. A particular thrill for the man who has lived "Speedway" all his life. 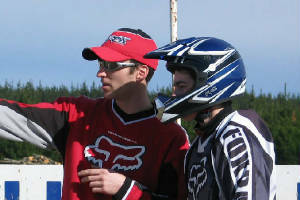 While racing for him was over, a weekend helping out at a Speedway training school has turned into 25 years of teaching youngsters to ride speedway. It was not long however, before Ronnie ventured onto the track to assist with the troublesome tapes, direct a little watering and bringing some of the riders in to line. It was fitting that a senior "Ronnie Moore" pupil won the A grade final after returning from two years in Australia. Daniel McKinlay to take the win from a hard riding Westport’s Michael Long and Oreti’s John Tuffley. Westport riders Mike Robinson and Sean Cox also made the final line up. Cox had picked up three heat wins earlier in the day to be top qualifier. Jonathon Able took out the B final from Steve Gunn and Scott Reed (Oreti). Under 21 competition was robbed of some interest when Andrew Bargh (Hastings) fell in an earlier heat and then suffered intermittent motor problems for the rest of the day. A formidable battle between Andrew Aldridge was looking promising but the Moohan brothers Jamie and Dylan kept the North Island hopes alive. Aldridge won the final from fellow Cantabrian Grant Tregoning with Dylan Moohan third. Junior 200 A final was an event of mishaps and hold-ups when a keen young Ryan Moss who was in fine form all day clipped a wheel and fell hard sustaining severe leg injuries. Doug Stenning (Oreti) secured the top spot from Hayden Bagshaw (Auckland) . Philip Bray was gutted when he fell while out in front with the race almost won. B final went to Karl Bagshaw (Auckland) from demo rider Vaughan Strugthers who was promoted to fill a gap in the field from Chris Harris (Timaru). Auckland junior Ryan Bagshaw won the 125cc final from Cory Lang (Westport) and Jake Askew. Side Chair racing was exceptional with some hard competition throughout the heats and finals. Several incidents saw a few nasty tumbles and no doubt some sore bodies. Triumphs, Norton, Weslake and Denco power units were very even and close. The Auckland pairings of Donald Hanley / Shane Mason, Perry Lane / Peter Barton and Karl Ostomy / Kyle Anderson were the order of the finishers in the classic section while Invercagil’s Doug Fox / Ryan Barclay and Nelson’s Nathan Ching / Nathan Davis tied 1st equal in the open class. Mere mms separated them on the line in the first final. Lionel Green / Nick Knowles (ChCh) were third after they won the 3rd heat .The 2nd heat was red flagged after the Invercargil pairing of Fraser Gillespie / Iain McCormick were tossed from their machine. Two laps in and a blanket covered all four units. Gillespie was squeezed out wide against the fence coming out of turn two. He then came back down low and backed it into the corner a little two hard . As he crossed up and slowed, he was clipped by Green as they came round. An excellent crowd, old familiar faces, fans and former competitors many going back as far as the Aranui days fronted. The CHCH media had given Ronnie excellent coverage all week including CTV3 interviewing both Ronnie and Tracy Holmes on "Pete Smith Hosts" and both TV1 and TV3 came to the meeting. A big days racing to mark the 50th anniversary of our first World Speedway Champion , Ronnie "Mirac" Moore.